SHARE THE GIFT OF READING AS AN ADULT LITERACY TUTOR! Tutoring can take place at the library or your choice of venue. There is also an opportunity to teach via computer or mobile device. Come join us! 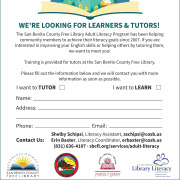 The San Benito County Free Library's Adult Literacy Program is searching for tutors to support, empower and encourage adult learners to improve their reading, writing, and conversation skills. No prior experience is required other than a desire to help others! The Adult Literacy Program offers free tutoring to any adult resident of San Benito County. Learners will meet weekly with trained volunteer tutors for one-on-one instruction to obtain help with meeting personal and educational learning goals. Volunteers should have knowledge of basic English spelling and grammar, must be 18 years of age, and willing to commit at least 1.5 hours per week for six months. We will provide training, materials and professional support staff for you and your learner. For more information on how you can make a difference in your community contact Shelby Schipsi or Erin Baxter at (831) 636-4107, extension 20.